Brooklyn Historical Society, one of the borough’s oldest cultural institutions, recently opened a second branch, making it easier than ever for visitors to immerse themselves in the history of New York City’s most populous borough. The museum’s Brooklyn Heights location houses unique historical artifacts, portraits and landscape paintings that represent Brooklyn through the ages. The newer Dumbo branch highlights the area’s transformation from a 19th-century shipyard to its present incarnation as a hub for culture, food and technology. Combining a visit to either museum with lunch and a stroll through the neighborhood gives your clients the chance to experience the borough like local. The main branch of Brooklyn Historical Society is housed in a turreted, Romanesque Revival building designed by George B. Post, also the architect of the formidable New York Stock Exchange in Manhattan. The surrounding neighborhood is known for leafy streets lined with brownstones and an abundance of restaurants and shops. The museum is open Wednesday through Sunday each week from noon until 5pm, and is located a quick walk from the Borough Hall station on the 2, 3, 4 and 5 subway lines, the Jay Street station on the A, C and F lines or the Court Street station on the R line. Group visits for 10 or more visitors can be arranged in advance by calling 718-222-4111, extension 241, or emailing tours@brooklynhistory.org. The Business of Brooklyn, a show mounted to commemorate the 100th anniversary of the Brooklyn Chamber of Commerce, opened in February and will run through winter 2019. The exhibition brings together an interesting collection of artifacts like coasters from Brooklyn’s many breweries, locally produced Eberhard Faber pencil sets and Depression-era Virginia Dare bottles and glasses from the Brooklyn plant of Garrett & Co. distillery. 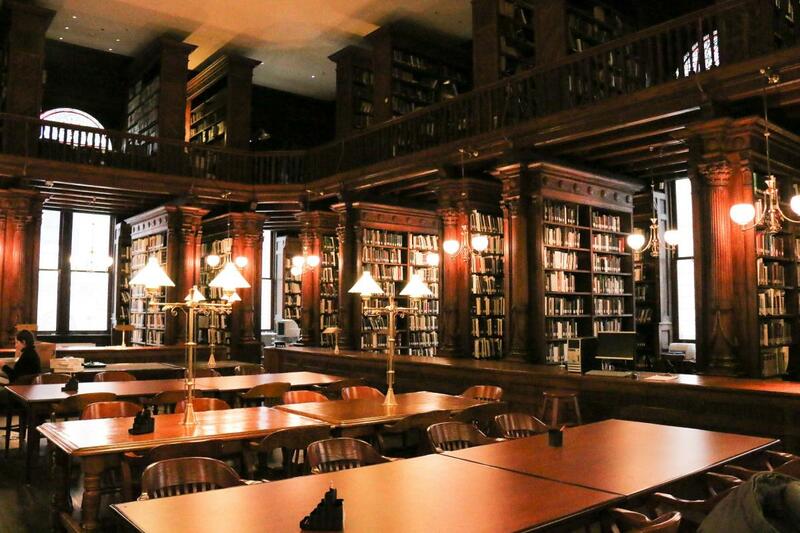 The second floor of the building is home to the peaceful Othmer Library, where visitors can pore over rare books in a spacious wood-paneled reading room with floor-to-ceiling arched windows. The library is open Wednesdays, Thursdays, Fridays and Saturdays from 1pm to 5pm. The Brooklyn Historical Society hosts community talks—recent topics have included “Black Writers in a Post-Obama America” and “The Rise of Antifa”—that let your clients engage with issues that matter to New Yorkers. The museum has also partnered with Big Onion Walking Tours to offer a two-hour jaunt through historic Brooklyn Heights that highlights Plymouth Church of the Pilgrims, an important stop on the underground railroad for slaves fleeing the American South in the mid-19th century, as well as sites that held significance for famous Americans like Truman Capote, Arthur Miller and George Washington. Last year a new branch of the museum opened along Brooklyn’s trendy waterfront. Brooklyn Historical Society DUMBO is located within Empire Stores, a converted 19th-century brick shipping warehouse in the shadow of the Manhattan Bridge. The complex is home to shops and restaurants as well as a public rooftop space with jaw-dropping views of the East River and Lower Manhattan&apos;s skyline. Waterfront, the museum&apos;s latest exhibit, chronicles Brooklyn’s role as a major port in the 19th and early 20th centuries. Visitors can see archeological objects harvested from a nearby site and learn about the crucial role that women played in the factories along the borough’s waterfront. Brooklyn Historical Society DUMBO is an 8- to 10-minute walk from the High Street station on the A and C subway lines, the Clark Street station on the 2 and 3 lines or the York Street station on the F line. Visitors can also visit the museum by taking the NYC Ferry to the DUMBO/Brooklyn Bridge Park landing. St. Ann&apos;s Warehouse, a much-loved local theater with an eclectic range of entertainment on offer, is right next door. At nearby Brooklyn Bridge Park, visitors can marvel at the panoramic view of Lower Manhattan and ride a historic carousel. On Sundays (10am–5pm) from April through October your clients can browse indie clothes, housewares, jewelry and a variety of vintage wares from some 70 vendors at the Brooklyn Flea outdoor market near the Manhattan Bridge Archway at Pearl Plaza. World-famous Jacques Torres Chocolate—known for their gorgeous truffles and chili-spiked hot chocolate—is also an easy walk from Brooklyn Historical Society DUMBO.